Last week, I gave my tips and tricks for writing a killer resume. 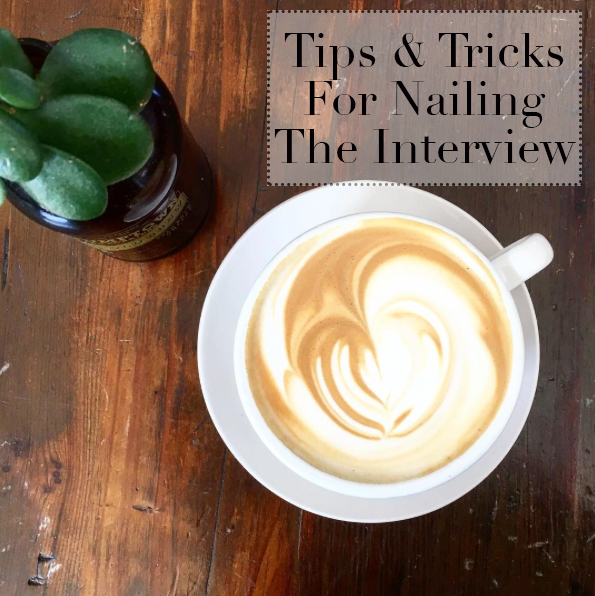 I only thought it was fitting to share my tips on nailing the interview today. You might be thinking, what credibility does she have? Well, in my last role it was my job to prep my employees for interviews and help them land the job. Not only that, every in-person interview I have had, I have received a job offer. This is not to brag - I'm actually horrible at phone interviews (generally the first step to the process) - but I have always been the type of person that knows if I can at least get an in-person interview, that I will get the job. There are some things that seem like common sense but it's actually surprising how many people forget about them. I wanted to give you all the tips you need so the next interview you have, you can wow the hiring manager, land the job, and start your path in your new career. Let's first debunk the phone interview. This is 99.9% of the time how the interview process starts - and by far the part I am the worst at. I tend to psych myself out, slur my words and not even form complete sentences. The biggest thing to remember is just to sell yourself. The only reason they are doing phone interviews is to weed out the people that wouldn't be a fit. Talk to your successes and be honest - this should be enough for them to bring you in. Note: Sometimes you just aren't the right fit for the role. Don't get discouraged! Why would you want a role where people don't think you're a fit anyways?! 1. You Can NEVER EVER Be Too Prepared. If you don't do your research then shame on you! You need to research the company, read current news stories on them, see what the blogs are saying. Always find out who you will be meeting with and research them too. You may reach ultimate stalker status but their LinkedIn page, Facebook, Twitter, and Instagram will tell you a lot. Don't think they aren't researching you either! The more you know, the better. Unless stated otherwise, you should always wear suiting attire. Tailor the type of suiting attire to your personality. I always wear some sort of color, print, and fun jewelry. I am a firm believer that prints, statement jewelry, and a pop of color can be professional. If you are unsure, always get a few opinions! Never the less, always wear a suit. It will leave a lasting impression and show the hiring manager that you actually care. There is nothing more I hate then starting off the interview with a weird handshake. You know those people that act like they don't want to touch you? Don't be that person. Women tend to be the worst, most reach their hand out and barely shake your finger. GROSS! You should be able to look the interviewer in the eye, smile, introduce yourself, and deliver a firm handshake. I have actually practiced this before and had people rate my handshake (i.e., if it was too soft or too firm). Practice and then practice some more! You want the interviewer to remember you - you want to leave a lasting impression. Make conversation! Let them get to know you. You may be surprised you have something in common, you have common friends, or maybe you're from he same place. You won't know unless you ask. I like when people give me the time of day to ask questions about myself, in return, I will do the same. That's what getting to know people means :). 5. Make Sure To Explain What You Can Bring To The Role. Let's say you aren't 100% qualified for this role - how then, are you going to receive an offer? You need to explain to the interviewer all of your strengths and what you can bring to the table. Reflect on previous work whether that be in previous roles, volunteer work, hobbies, etc. If they are looking for someone who has leadership experience but you don't have any in your work history, talk about what you did in college, maybe groups or projects you lead. Give them reasons not to doubt the lack of experience but instead show them the wide range of experience you have - because you do have it! 6. Ask At Least Three Questions. Coming to the interview with questions not only means you are more prepared but the interviewer will respect you for asking them. Sure, they might answer some of your questions but that is why you need to ask non-generic ones! Rather then asking, "Could you tell me what a day in the life of an event coordinator looks like?" Ask, "What are your current weekly and monthly KPI metrics that all event coordinators must hit - what are some challenges they run into?" I was able to ask that question when I interviewed for my current role because I understood what the job was ahead of time and I could initiate educated questions based on the job description. Don't think it's not okay to ask the generic questions, because it absolutely is! I just want to challenge you to think outside the box. 7. Ask For The Role. At the end of every interview (if I know I want the position), I always ask for the role. It's as simple as stating, "I can't thank you enough for taking the time to interview me, I truly think I would be a valuable asset to this company and would bring a great deal to the team, what is the next step for consideration? Is there anything preventing you from making the job offer to me now?" This is definitely ballsy - but with the unemployment rate extremely low, you have nothing to lose. If they don't make you an offer in the interview then it's all a waiting game, and that's just a waste of time! It's either you or the gal in the waiting room. Who's it going to be? 8. Always Get The Timeline & Next Steps. This is simply for your own sake - ask what their timeline for closing the role is, what the next steps are, and when they will have a firm decision. 9. Send A Hand Written Thank You. This is just the cherry on top of the cake. I don't know about you but I love getting mail, sending a hand written note shows you put in effort, are thoughtful, and very interested. This may seal the deal if the interviewer was on the fence. Let's think about it, what if it's just down to you and one other person. You both have the same credentials and great personalities, but you sent a hand written thank you letter and the other person didn't. You will be the one to get the job! Make sure to write more then a "thank-you." Reflect back on your conversations, thank them, and tell them once more why you want the position. 10. Know That You Can Land The Role Even If You Aren't Qualified! My rule of thumb is, if you meet 80% of the job qualifications, then you are qualified for the job. Every position is a learning curve, don't be afraid to challenge yourself. You need to let the interviewer know this too. Make sure to tell them you are motivated, driven, and up for any challenge. Show them the strengths you do have and how those can replace any skills you may be missing. Turn your phone completely off or leave it in the car. Interruptions are an interview killer! Bring copies of your resume. Chances they will already have one on file are very high but just in case they din't have time to print one off! Ask them to give you a tour if they don't. Have your list of weaknesses prepared. Don't forget to share with them how you work on your weakness or what you do to combat them. Get the interviewers business card - that way you have all their contact info! Great way to send a follow up card, email, and phone call! If you have any other tips, please share below!